I-Mockery’s 2017 Halloween Club Packs Have Finally Arrived! Order Now! "Death has come to your little town, Sheriff." I'm pretty sure Dr. Loomis wasn't speaking of Michael Myers when he uttered those words; he was referencing I-Mockery's Halloween Club Pack! Fortunately for you, it's October, so there's nothing wrong with having death delivered to your door. 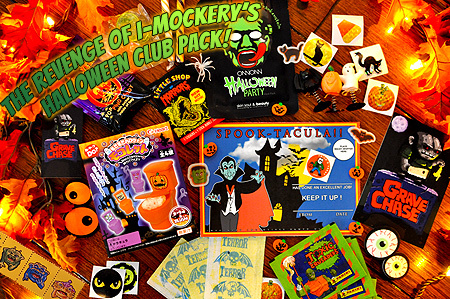 Rejoice, for I-Mockery's Halloween Club Packs have returned for the 2017 season! Getting so many unique Halloween items in bulk quantities is no easy task, I assure you, but I've managed to collect some insanely cool spooky goodies for everyone. I even have some killer Halloween items from South Korea, Japan, Venezuela, & more this season, so get ready for some frightening fun you won't find anywhere else. Behold! 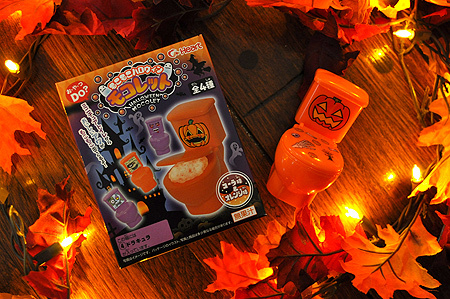 That's right, this October, I'm going to be sending you a Halloween Toilet from Japan! It's actually a candy and a toy toilet (a "toylet" if you will) - it includes two packs of tasty powder (orange and cola flavors) that foams up inside the toilet when you add water to it. After that, you drink up with a straw. Truly one of the most unique Halloween candies I've ever had in my entire life, and I'm super excited that you're all going to get a chance to try it out! When you're done with the candy, these orange or purple plastic toilets come with sets of spooky stickers that you can apply to them so you'll have a completely unique Halloween decoration to put on display for years to come! Getting these in bulk was a small miracle. I spoke with so many places in Japan and finally found them; I'm happy to report they're now in my hands and have arrived just in time for Halloween! Each Halloween Club Pack will come with one Halloween Foaming Candy Toilet still sealed in its original box. For more details, you can see my 2016 review of the Halloween Foaming Candy Toilet. No, your eyes do not deceive you; what you're looking at are genuine Halloween Beauty Masks from South Korea. Did I say this year's Halloween Club Pack was a doozy or what? 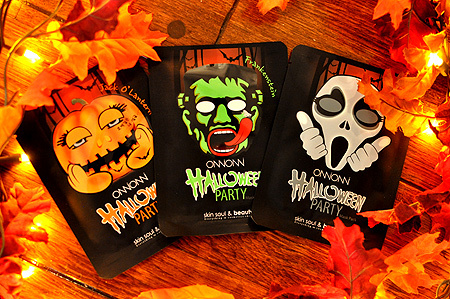 Whether you're a She-Wolf or a He-Wolf, these masks will leave your face looking and feeling macabre and marvelous - because they contain things like the essence of pumpkin, green tea, and more. Hell, they'll probably come in extra handy if you're planning on wearing face paint as part of your Halloween costume this year. Next up, we have this vintage "Spook-tacula" Halloween award that you can give to a friend... or yourself! Even better, it comes with a place for you to put your own "Wacky Whiffer" scratch & sniff sticker. 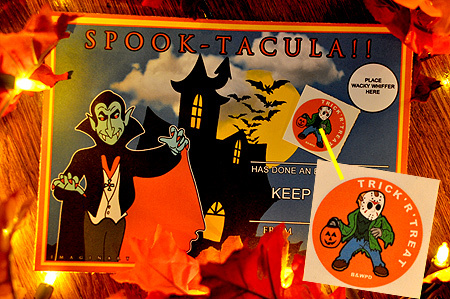 But not just any Wacky Whiffer from the nineties... a Jason Voorhees sticker! My favorite thing about it is that he's traded in his machete for a pumpkin pail to go trick-or-treating with, and he looks a bit apprehensive. It's almost like he's worried somebody is gonna try to steal his Halloween candies. Most importantly, when you get this Halloween Club Pack, you can finally answer the question that's been on your mind for decades: What does Jason Voorhees smell like? Speaking of killer stickers, I'm including three packs of the amazing, vintage 80s Terror Stickers from Venezuela. If you're not familiar with them, definitely check out my recent article, because these stickers are absolutely nuts. Bright neon colors, monsters, and some of the most ridiculous & hilarious horror scenes you'll ever see. I haven't even collected all of them, so you'll likely be getting ones never seen before on this site. You'll also be getting a limited edition Grave Chase souvenir postcard and sticker! They're nice & glossy and feature everyone's favorite evil Groundskeeper, standing atop a tombstone, waiting for his next victim. 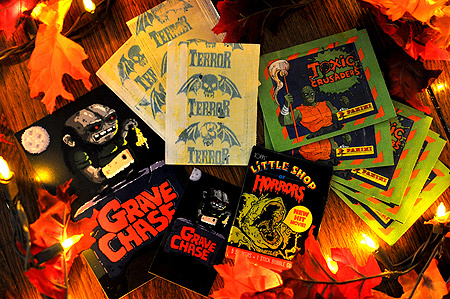 And since no Halloween Club Pack is complete without an assortment of vintage stickers & trading cards, I'm throwing in FIVE packs of Toxic Crusaders stickers since everybody loved them last year, and a pack of Little Shop of Horrors trading cards. Just don't eat the gum, cuz it's so old that whatever it does to your innards would likely be scarier than anything else you find in this pack! 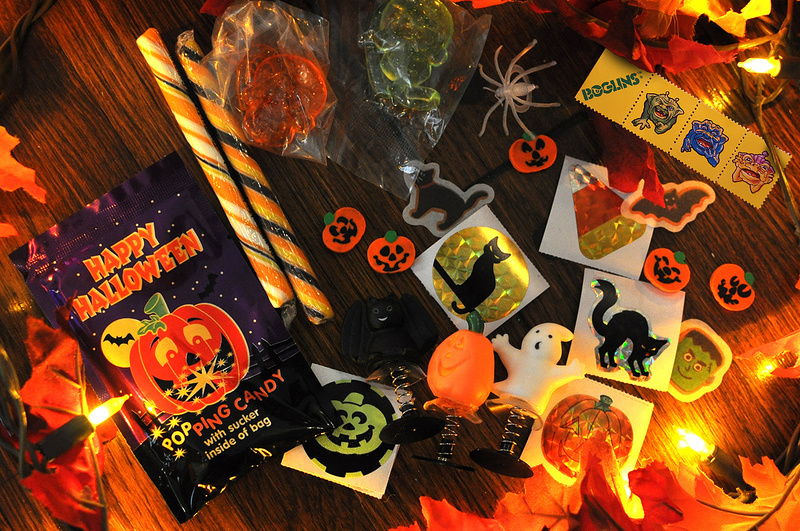 Last but not least, I'm including another batch of random Halloween toys, treats, trinkets, and stickers in every pack. You'll find all sorts of goodies in each pack including vintage Boglins stamps from the eighties, Halloween popping candy, sticky skull slappers, Halloween candy sticks, the always popular orange & black Halloween fortune cookies with actual spooky fortunes inside them, pop-up monster figures, and more! There will be other little surprises included with every order to ensure this box o' goodies keeps you entertained all month long. So there you have it. These packs are absolutely loaded with Halloween fun. I really can't wait to hear what all of you think of 'em when they arrive at your doorsteps. Please note that while I've once again made even more club packs than I did in 2016, they're still limited in quantity. Once they sell out, I won't be reproducing them again, so be sure to place your order early to ensure you get one and aren't left standing alone in a pumpkin patch like a disappointed Linus waiting for the Great Pumpkin to arrive. Nobody wants to be a disappointed Linus. Please keep in mind, you're not only getting a club pack filled with loads of hand-picked Halloween fun, you're also helping support all the time and work put into I-Mockery. Halloween season is easily the most important time of the year for me, but it's also the most expensive time as well. In addition to the cost of running I-Mockery, I rack up some hefty traveling and purchase expenses for all the articles and reviews I post on this site, so you purchasing my club packs and other merch really helps offset those costs. Also, if you have any friends who might like the Halloween Club Pack, please let 'em know about it before the packs sell out! For international customers outside of the United States, due to the widely varying shipping costs and all the time it takes to fill out customs forms among other things (time that would be better spent writing new Halloween articles for the site), the club packs are not available for you to purchase. That said, you know I don't like to leave anyone out, so if you *reeeeally* want a pack / can't live without one, and you live outside of the United States, drop me an email about it and I'll do my best to set one aside for you and we'll work out the shipping costs later. I can't make any promises, as I often get more requests than I can handle, but I'll do my best to get a club pack into your hands just like I did with a bunch of you last year. Alright, that's all for now. I really hope you love this years pack, because I honestly didn't think I'd be able to get all the eerie items from overseas for them in time for Halloween. But the Great Pumpkin has smiled upon us, for I was somehow able to gather all of these awesome Halloweeny goodies to send your way. As always, I wanted to give you what I see as "Halloween in a box" to make your October even more spooktacular. Can't wait to hear what you think of 'em! Thanks in advance to all of you who help support I-Mockery and all the work I do every Halloween season by ordering one. Have at it, Halloweenies! I've been crossing my fingers that there was going to be a Halloween Club Pack this year! I've bought them the last 2 years and they really do feel like Halloween in a box. This year's look amazing! Can't wait to have my very own Halloween toilet sitting on my desk. WOO HOO! I was getting worried that these weren't gonna happen this year.I've bought them for the past 3 or 4 years now. I skipped over the article so that it would be more of a surprise when it arrives. This is my first year, I saw this last year & it was too late, but this year I am hopefully not missing it. I saw this site last year & I love the feel of the creativity from the makers of this site & appreciate the creativity from all that make this site. Keep doing what you do, youre all helping to make Life more enjoyable here, & that is always Good. Been following your site for just about 10 years (gosh has it been that long! ), and your Halloween content is always the highlight of the season. Keep up the great, unique, and very authentic work! I got mine yesterday. I bought it for the toilet mostly (and the Terror stickers after seeing some of that art in your article), and got the purple zombie (#2.. hehe), and the pumpkin face mask! :D Everything in the box is cool (that orange fuzz is headed to the abstract filmmaking box), and definitely brought the excitement of Halloween back.. Last time it felt like this was probably the early 90s. I'll keep an eye out for this next year. Thanks! Billy - Indeed! Who wouldn't want a Halloween Toilet sitting on their desk? WhiteKenny - It took longer than usual to release the pack this year since many of the supplies came from overseas, and I wanted to make sure I had them all in-hand before I announced the pack. But never fear, the club pack is here! J - Thanks for the kind words, and I hope you enjoy your pack whenever it arrives! JoeyJoJoJr - Awesome. Please lemme know what your nephew thinks about it when you give him the Halloween Club Pack! Strange Voyager - Ah, that's great! I'm glad the club pack arrived and it's reinvigorated your Halloween enthusiasm this year! Thanks for the support and I hope you'll stick around for the rest of the season on I-Mockery, cuz our best Halloween articles are still to come! Got mine yesterday! Your Halloween Club Packs always put a smile on my face. I LOVE the Terror stickers! They're just so ridiculous and so 80's! My favorite Terror sticker I got is 'Bad Boy' which is Frankenstein's monster jammin' on a stand-up bass. Also, I can proudly say that I have a purple zombie Halloween toilet sitting on my desk. I doubt many people have said that sentence before. Really great work again! Thanks, Rog!! Been a fan of the website for about a decade, and I never went through with ordering a Halloween Club Pack. This year I finally pulled the trigger and ordered one, I absolutely love it. I’m going to win the Halloween cube decorating contest at the office for sure now, the Halloween toilet seals the deal. Hey Roger, It's your old friend Cody Magnuson just letting you know I'll be ordering one of your "Halloween Club Packs" this year like I have the past two years. Always looking forward to sharing and appreciating your creative effort this year, The Packs look great as always and this one looks like one of your best so far. Great work and keep it up, love the stories and reviews so far also, Thank You Roger! Man, the last time I was here was years ago... about 2007? I can't believe that you guys are still around and I'm happy about it. I saw your Halloween pack in one of Pixel Dan's videos. Really cool thing, I must say. I think, I will order one next year. Keep up the good work! RoG he loved it. It was like opening a Christmas present for him. Already putting stickers over everything. Thanks can't wait for next year. Previous post: Grave Chase Has Arrived! Now Available On Steam For PC, Mac, & Linux!